Background: Preoperative cervico-thoracic kyphosis and cervical regional positive imbalance are the risk factors for postoperative cervical kyphosis after expansive laminoplasty (ELAP). However, the relationship between preoperative global sagittal spinal alignment and postoperative cervical kyphosis in patients with cervical ossification of the posterior longitudinal ligament (OPLL) is unclear. The purpose of this study was to investigate the relationship between the onset of postoperative cervical kyphosis after ELAP and the preoperative global spinal sagittal alignment in patients with OPLL with normal sagittal spinal alignment. Methods: Sixty-nine consecutive patients without preoperative cervical kyphosis who underwent ELAP for OPLL and cervical spondylotic myelopathy (CSM) were enrolled. The global sagittal alignment radiography preoperatively and 1 year postoperatively were examined. The subjects were divided into a postoperative cervical lordosis group (LG) or a kyphosis group (KG) at 1 year postoperatively. The preoperative global sagittal spinal alignment between LG and KG in CSM and OPLL was compared. Results: The occurrence of cervical kyphosis after ELAP was 7 of 27 cases (25.9%) in OPLL and 13 of 42 cases (31.0%) in CSM. In patients with CSM in the KG, C7 the sagittal vertical axis (SVA) was smaller than in the LG. 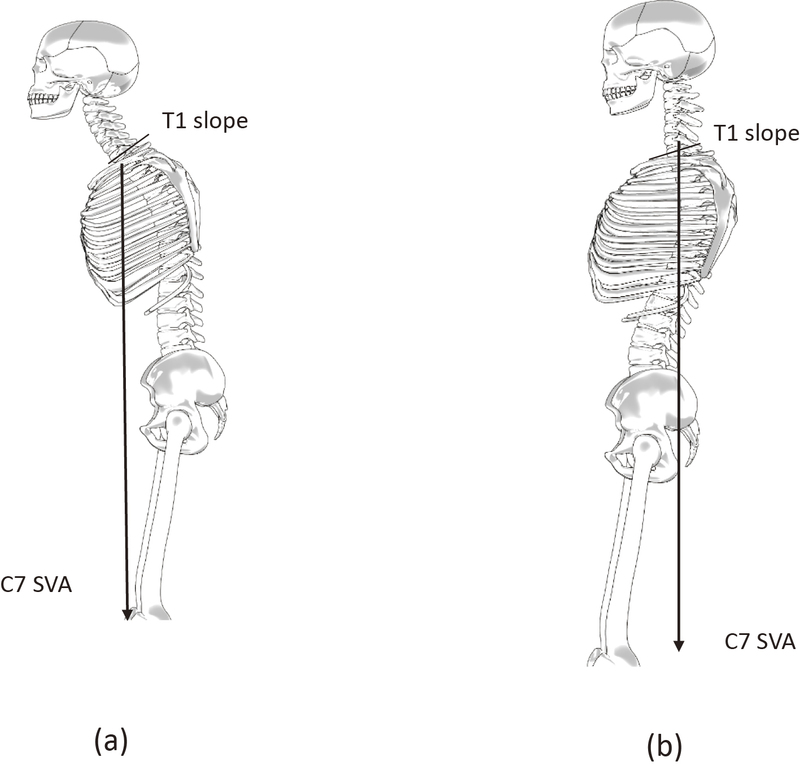 In patients with cervical OPLL in the KG, C2-C7 angle, C2-C7 SVA, and thoracic kyphosis (TK) were smaller than those in the LG. In OPLL, the age of the KG was younger than that of LG; however, this was not a significant difference in CSM. Conclusion: In patients with cervical OPLL without preoperative global spinal sagittal imbalance, preoperative small C2-C7 angle, C2-C7 SVA, TK, and younger age were typical characteristics of postoperative cervical kyphosis after ELAP.